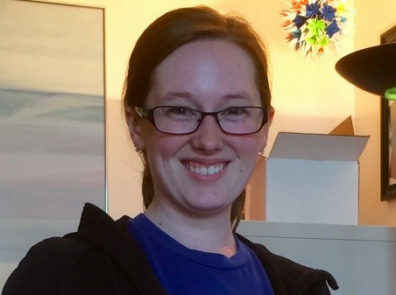 WSU alumnae Megan Slaker received the Hal and Joan Dengerink Graduate Fellowship as a graduate student at WSU Vancouver. It was during middle school when Megan first became interested in human behavior; specifically what caused some individuals to use or abuse drugs and alcohol while others avoided them. A number of her close friends began using, and that piqued her curiosity. In high school, Megan found she really enjoyed her science classes, and by the time she was in college, she took as many biology and chemistry classes as she could, thinking she’d go into pre-optometry. But the addiction question fluttered in the back of her mind. After speaking with a number of professors, taking psychology courses, and reading more about reward and thrill-seeking behavior, Megan decided to pursue neuroscience research. Megan earned her bachelor’s degree in biology with a minor in chemistry from Bethany Lutheran College in Mankato, Minnesota. As she explored graduate programs in neuroscience she became intrigued by WSU Professor Barb Sorg’s research, which investigates methods to prevent relapse to cocaine addiction in rats. During her time at WSU, Megan made great use of her time. 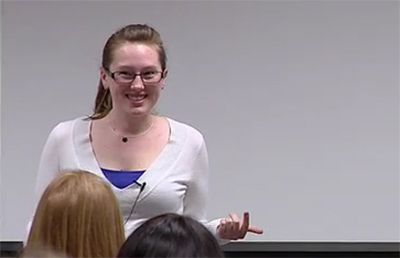 She won first place in WSU Vancouver’s inaugural Three-Minute-Thesis Contest, competing against six others. She also participated in several NW Noggin events, including “Bikes, Brains and Skateboard-filled Beers”, and “Edgefield EPSPs: Growing in Networks @ SFN”. Megan also worked on a project with Barb Sorg that was featured in the Seattle Times. Megan Slaker presents her research during WSU Vancouver’s inaugural “Three-Minute-Thesis” competition, where she earned 1st Place. Megan filled a student chair on the Graduate Studies committee for two years. Although it was a non-voting position, she provided feedback about new and updated courses for the graduate school. She read syllabi and new program submissions and evaluated whether, as a graduate student herself, she thought a course was suitable, and therefore offered suggestions. The position enabled her to learn how a committee functions, she said, and was a behind-the-scenes-look at the WSU Graduate School, a way to ensure it was evolving. Megan served as President and Sergeant at Arms of Salmon Speakers Toastmasters and conducted science communication workshops with high school teachers and students. Graduate school ignited her passion for teaching, science communication, and making research accessible to the public. Megan kept busy in other endeavors as well. She collaborated with Phil Uribe, a Ph.D. candidate in neuroscience. The two co-founded a COUGS (Career Options for Undergraduates and Graduates in STEM) series on the WSU Vancouver campus. Initially, they spent time researching and identified many resources for students who might want to explore careers outside academia. With support from the Office of Graduate Education, Megan hopes more COUGS-like series will continue at WSU. Having earned her doctorate in neuroscience at WSU in spring 2016, Megan also received the GPSA Award of Excellence. In summer, she began a postdoctoral fellowship at the Medical College of Wisconsin in Milwaukee where she studies how the brain responds to drug rewards versus non-drug rewards. She has not yet decided whether she will stay in academia for the long-term, but the postdoctoral fellowship enables her to continue training and exploring options beyond more traditional routes. In the neuroscience program, Megan was responsible for paying student fees and a residual tuition expense, but the funds from her fellowship covered those. Since she could pay them at the beginning of the semester, she could put more toward the student loans from her undergraduate degree. She also used some of the scholarship money to buy books integral to her field but that she’d put off buying because she couldn’t justify the expense. Lastly, she used some of the funding to purchase a practical and unexpected expense: glasses. The fellowship helped offset the cost of the eye exam, frames and lenses.